On the afternoon of Wednesday March 27, Coyote Point Recreational Area’s 149 acres appeared a bit under-discovered for a such an extraordinarily beautiful, diverse and accessible destination, just seconds from Peninsula Avenue exit of Highway 101. At this third outing of the 2019 SMC Hike-a-Palooza for Environmental Leaders — 10 Treks, 20 Weeks, 1 Great Community — every other Wednesday from February 27 to July 3 (flyer), our team of sustainability leaders traced 4.1 miles of coastal trails in just under two hours to find out why. Passionately sharing solutions for a smaller global footprint and happier and healthy living, we uncovered many reasons to repeatedly visit this well-preserved open space, impossible to cover in a single trip. 1. Playgrounds, play fields, & EV parking – Starting at the large and wonderous Magic Mountain Playground and adjacent fields, we found two ChargePoint stations, plenty of car and RV parking, and room for hundreds of kids on slides, swings, and lawns. 2. Shaded picnics – We then traversed the Bay Trail south, past Coyote Point Pistol and Rifle Range (open to public and law enforcement teams), and the Parks Department Captain’s House, and found a dozen landscaped, shaded picnic areas – good for 100+ friends, families, and a smiling mother earth. 3. 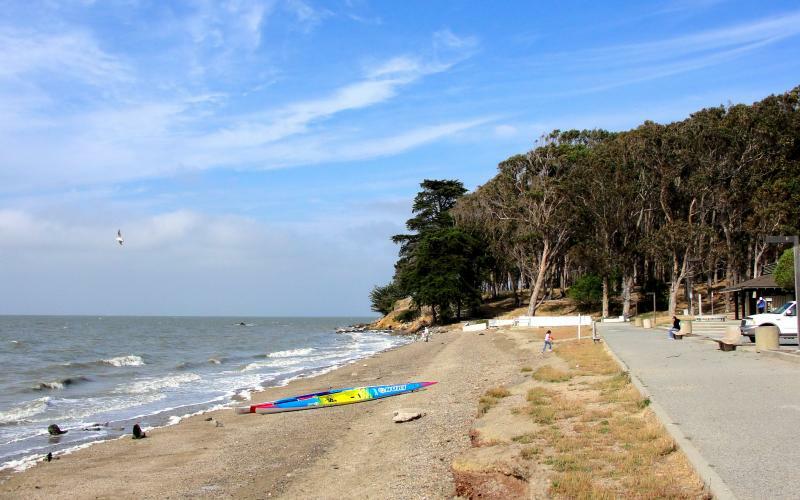 Bayside walking – We briefly exited the park on the breezy Bay Trail, inhaling fresh air and surveying choppy waters; then quickly hit our southern turnaround point, the well-equipped Harbor View Playground in San Mateo. that hosts weekly sailboat races and summer youth programs. 5. Nature museum & education – Continuing north, now west of the Marina, we climbed a short slope and arrived at the CuriOdyssey science museum and zoo. Harnessing old memories, I was comforted to find animal feeding, science experiments, and intriguing exhibits still provide natural world learning for young and old. 6. Scenic & historical reflections – At the park’s coastal bluff midpoint lies tributes to Merchant Marine and Pacific Coast Cadets. There we learned of the 1940s training academy and savored views of San Bruno Mountain, SF skyline, Oakland shipyards, and Mt. Diablo. 7. Beach time, water sports, & other rec – Lastly, we traversed the sandy beach and water sport concession with windsurfing and kiteboarding rentals and lessons! Other recreation includes running, biking, fitness zone training, and golfing at the adjacent San Mateo Poplar Creek Golf Course. True to its goal for the third of ten treks, the Hike-a-Palooza, forced us to “get social, enjoy nature, and broaden networks.” But we still did not see why the park was so empty on such a beautiful afternoon. At 6pm, now thirsty and hungry, sustainability discussions spilled onto Steelhead Brewery’s back deck, accompanied by tasty ales, lagers, nachos and burgers. And more sunshine! Additional pictures. 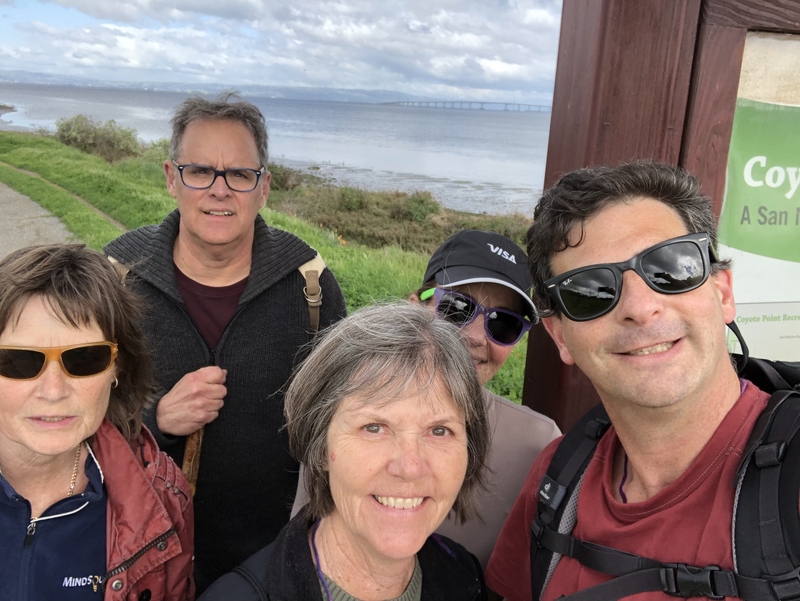 2019 SMC Hike-a-Palooza, Burlingame Parks, Coyote Point, coyote point rec area, coyote point recreation area, Marina, Museum, Park, picnics, playground, recreation, san mateo, San Mateo County Parks, san mateo county parks foundation, smcp foundation, water sports, wind sports. Bookmark.